uh yeah. 2-3 hours? i think it came out okay. *chuckles* For a 2-3 hour wall, it's quite nice. The colors work well together with the reds and purples. Plus, it's oldskool techsheets. You don't see enough of those around anymore :D The purple ribbons look a little strange though since the metal ribbons out of the mecha are blue, so they don't seem to quite match. A bit more smoothing on the scan might be nice, it's just the slightest bit grainy compared to the sleekness of the background. Nice wall, the colors are wonderful. And btw, where did you get that scan? It's a great one. Good job. Fav 4 sure. 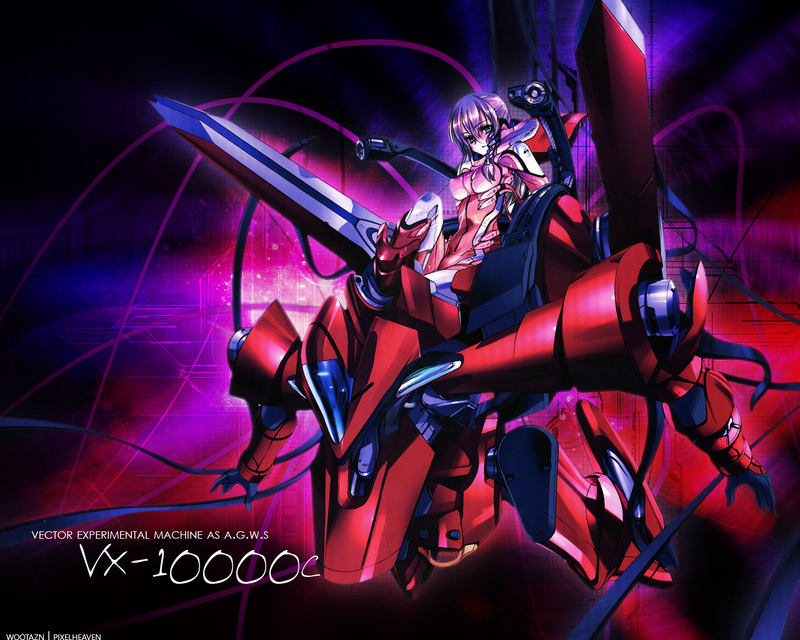 If this is indeed a vx-10000 agws, made by Vector, than this wallpaper belongs in the Xenosaga section. Very nice with the colors. I like it, though this is a Xenosaga a.g.w.s. unit but the girl doesn't show up in Xenosaga. Strange crossover? o_0 Keep on with the good work! damn this is too cool to be true,,,,,by far this month wallpaper on the top!!! !